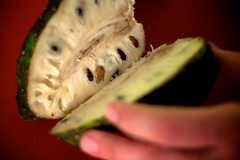 Which would you rather try… Eating a Guyabano or a Soursop. Some of you know neither fruit. Some of you know one of these two fruits and probably only a few of you know both fruits. But that’s okay. Which would you prefer? I am betting that a majority of you would prefer to try a Guyabano (pronounced GUY – a – BAH – no) over a Soursop (pronounced pretty much as you would guess it). If you haven’t tried (or even heard of) a Guyabano, you might think that the name of the fruit sounds rather— exotic… interesting. Soursop sounds, well, sour, mushy, uninteresting. I have never done a test on this, but I would like to suggest that perhaps 85% of people would be more enticed by the name of Guyabano, while the remainder would find the name Soursop as being more appealing (or maybe undecided). Now suppose we set up 4 randomly selected groups of people (maybe 10 persons each). Group A: Given Guyabano to eat but not told the name of the fruit. Group B: Given Soursop to eat but not told the name of the fruit. Group C: Given Guyabano to eat after being told its name. Group D: Given Soursop to eat after being told its name. Suppose each member of the group would score the fruit (taste, texture, smell, appearance, etc.). Could use a Likert Scale (ranging from 1 for worst to 5 for best). Now let’s imagine some possible scores that come from the groups (I am making these up, but I think could be pretty reasonable). This is quite reasonable numbers. You see, Guyabano and Soursop are two names for the same fruit. When the names are not given (as in Groups A and B) the score is based on the fruit itself. Thus Groups A and B should have very similar scores. The difference between Group A and Group C is the addition of the name of the fruit (Guyabano). The difference between Group B and Group D is the addition of the name (Soursop). If the name is positive, the name should make the fruit more appealing. If the name is negative, the name should make the fruit less appealing. But is this logical? Didn’t Shakespeare say “A rose by any other name would smell as sweet.”? But according to the Sapir-Whorf Hypothesis, named for Edward Sapir and his student Benjamin Lee Whorf, our perceptions are affected by our language. There is a reason why we buy Kiwifruit in stores and not Chinese Gooseberries. The fruit is not different, but the name affects its interest. How does this work? I really don’t know. But consider Guyabano again. It sounds exotic, tropical, interesting. When one sees it for the first time, those preconceptions are reinforced but its alien and interesting look. When one opens it up, it has a sweet smell and has a taste quite a bit like candy manufacturer’s interpretation of a some mysterious tropical fruit. Again, it is easy for us to find support for our preconceptions. But the same can be said about Soursop. The name is unappetizing. When one sees a soursop for the first time, it looks… weird— green, odd-shaped, with little horns on it. It’s texture is soft and mushy (when ripe) which is reinforced by the name. Tasting it, it is likely that one would be surprised that it is sweeter than expected, but there is a tanginess in it that reinforces the perception of sourness to some extent. We are affected by language. For years furriers did not sell skunk fur. They sold “Alaskan sable” or “Black marten.” Why? Because people were not comfortable wearing a truly beautiful fur that made one think of a small smelly rodent-like animal. I think now there is a greater acceptance of skunk as a wearable fur (except for the anti-fur folks of course)… but it has taken decades. Language is powerful. In Christian missions it is powerful as well. Titus 2:10 talks about how we are to decorate, adorn, or make attractive the Gospel (good news) of Christ. The context there is regarding action. However, language also matters. I Peter 3:15, for example, describes the care we must have in choosing our words regarding our faith. Why (asking the same question yet again)? Because although God’s love, care, sacrifice, and relationality with regards to us is (I would suppose) nearly universally appealing, a gospel presentation that attacks or demeans a specific culture may well make the gospel unattractive. A gospel presentation that makes God look ugly is not a good presentation. Jesus warns us about the danger inherent in causing a little (immature) one to stumble. Are we also responsible for the perceptions (misperceptions) that result from a poor communication of God’s message? This is not about lying or telling the truth. Are we responsible for giving a presentation of God’s message without concern about the perception it may create? By the way, many tout guyabano as a miracle health fruit. Don’t know if that is true… but it is high in Vitamin C and makes a wonderful fruit shake. Years ago, my wife was doing medical work in La Union, Some of the ladies in the community were asking for Vitamin C tablets. My wife looked up and saw that the community was full of guyabano trees and these trees were full of fruit. She told them to eat guyabano. More info below… so enjoy.